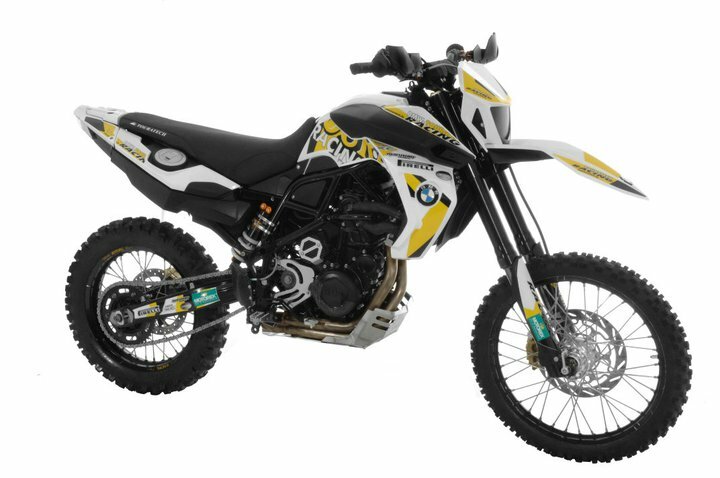 The BMW accessory specialists at Touratech are known for pursuing wild bike ideas and creating new identities for BMW GS motorcycles. 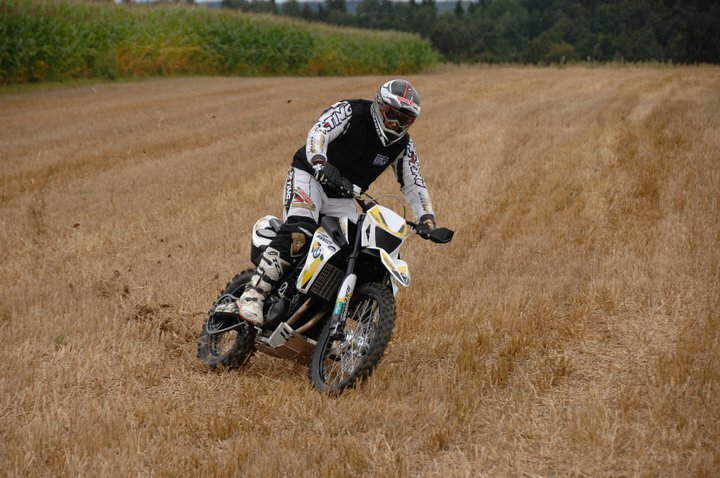 In the early days, the company’s race team achieved some remarkable victories over conventional lightweight enduro competitors with the Touratech ‘Oryx Extreme,’ which was a complete redesign based on the F650GS. 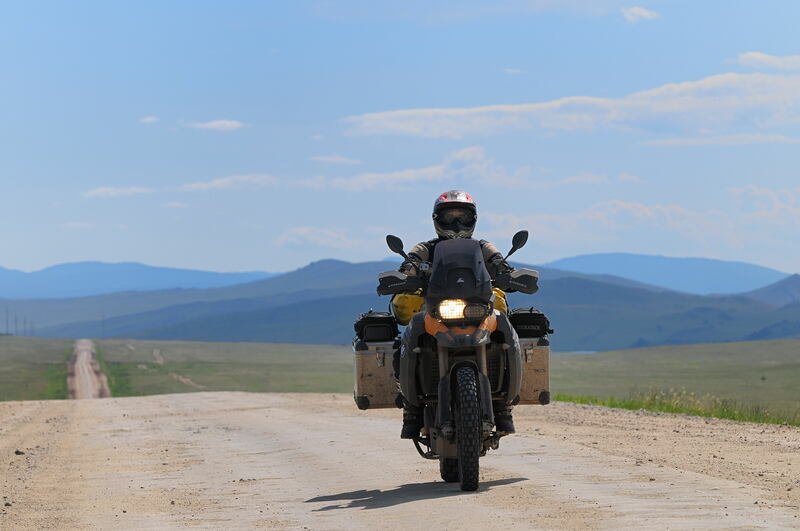 This year the Touratech Race Team converted a fully equipped long-distance F800GS on which Andreas and Claudia Hulsmann toured the former Soviet Republic during their 20,000-mile ‘Course Easta’ trip, into a competitive enduro racer with a slender design and dirtbike styling. Dubbed the ‘XXL,’ the F800GS made its racing debut at the Welsh 12-hour enduro race "Dawn to Dusk" piloted by Touratech Race Team Mechanic Lars Wurdemann. 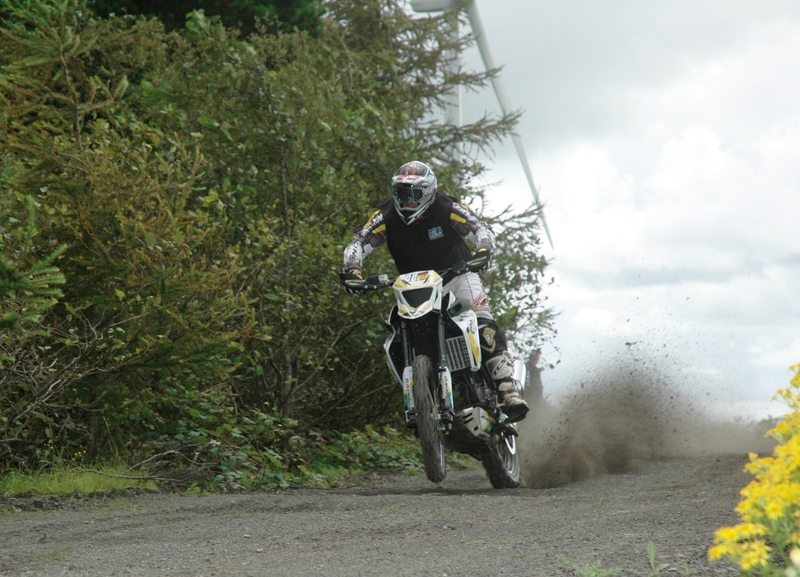 To truly test the abilities of the bike, Lars competed as a marathon rider in the Expert Class against a field of light-weight 450 enduro bikes on the 20-mile circuit in the forests of South Wales. He completed the race successfully in ninth place after seven laps, finishing in 12:06:58 hours. "It’s true that the development team loves to fabricate exotic bikes," explains Touratech’s CEO and Race Team Director, Jochen Schanz. "However, the real mission of a project like this is to develop new technology and ideas that will result in better products and an enhanced user experience for our customers." The demanding conditions found in extreme enduro racing provide a perfect laboratory in which Touratech products can be tested and improved. 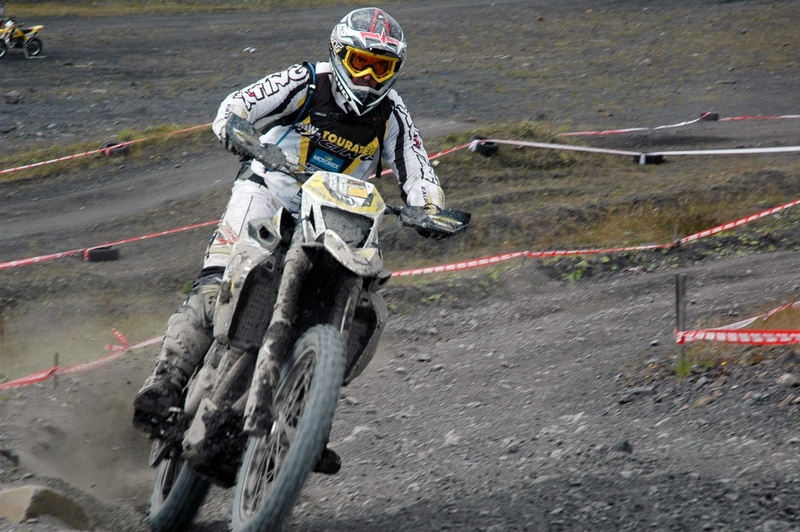 Technology from this project will shape future products in the Touratech catalog. 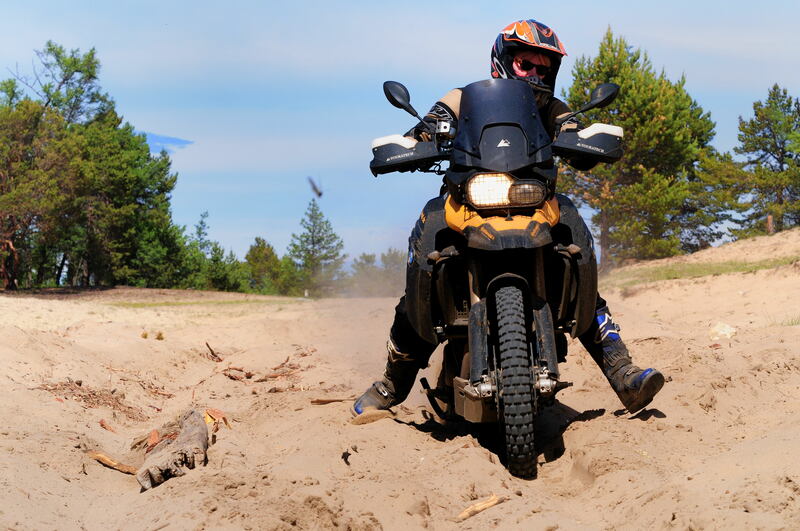 Lars Wurdemann and Touratech developer Ian Rowley were responsible for the transformation of the bike. The team began the project by completely stripping down the F800GS. 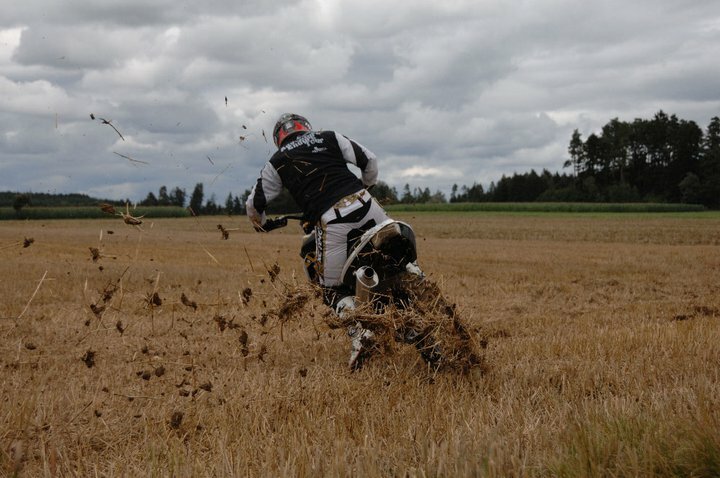 Using knowledge gained over the last decade of building motorcycles for the Dakar Rally, they evaluated what was necessary for off-road racing, and made modifications to reduce weight, enhance durability, and improve handling. An important element for extreme terrain is the suspension. The two-cylinder machine was fitted with an Ohlins TTX long-travel fork and a custom built shock absorber by Tractive Suspension "both are high-end products, there is nothing comparable," explains Lars Wurdemann. The Remus exhaust system was also made specifically for this bike, as was the KAHEDO sport seat which gives the rider more freedom of movement. The front wheel is modified to a single disk brake and the rear wheel upgraded from 17 to 18 inches by Haan Wheels. The original body panels were modified by Touratech designer Bart van den Boggard, giving the 800 a totally new look. This was further achieved by changing the fender and adding a light cover and WRP handlebars to complete the enduro package. 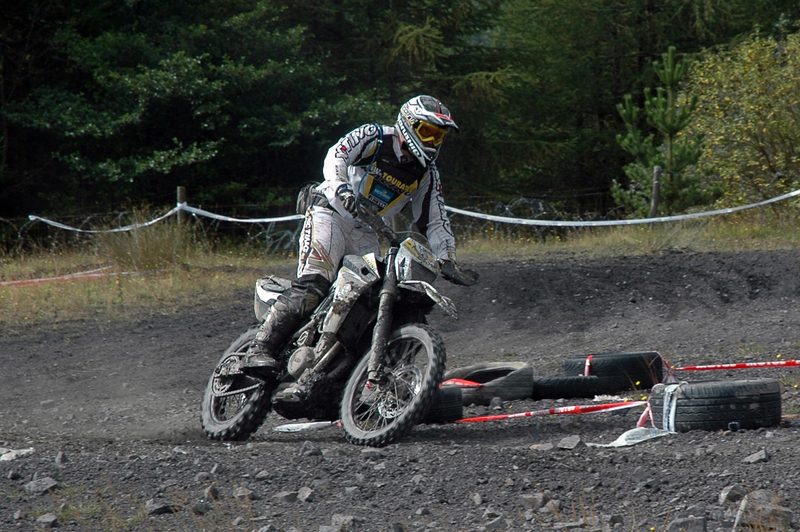 To ensure that man and machine go the distance in the "Dawn to Dusk" race, the 800 was equipped with the following accessories from the Touratech range: 15 and 47 tooth sprockets, Uni air filter, folding brake and clutch levers, long distance footpegs, as well as guards and protection for the radiator, engine and drive-train.